Blue Valley Recreation Commission was honored by the Kansas Recreation and Park Association (KRPA) earlier this year. Former commissioner Lou Wade and current staff member Jim Chladek were recognized as distinguished professionals. KRPA awarded Wade the Distinguished Commission Member award for his enthusiasm, passion, and advocacy for parks and recreation. An effective policy maker, he was also a successful relationship builder and was not shy about sharing the Commission's positive impact with legislators. Through his eight years of service, Wade never lost sight of who he served – the citizens of Blue Valley – and was willing to work collaboratively to best serve their needs. Wade served as a model Commissioner and earned the respect and appreciation of the community, staff, and fellow commissioners. "Lou has been a leader and visionary during his time on the Blue Valley Recreation Commission," said commission chair Colleen Browne. "His energy and passion are evident in his commitment to the Blue Valley community." Chladek, administration manager, was honored with the Outstanding Leadership Award for his commitment to continuous improvement. 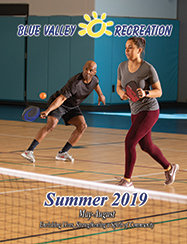 Chladek spearheaded Blue Valley Rec's safety committee, involving key staff members to develop goals and strategies that strengthen the Commission's pledge for clean, safe fun. Recently, he developed BVRC University – an online learning library - as a key tool for professional development. At the state level, Chladek has served as a session speaker at KRPA conferences, KRPA's Young Professionals, and Tomorrow's Leaders. "Jim's commitment to safety and financial stewardship is unmatched," commented executive director Steve Baysinger. "His wide range of responsibilities is a direct measure of his leadership with a head for service."